Chronos 5.0 (1993) - Sci-fi-central.com. USA  1993  89m   Directed by: Michael Harrison.  Starring: Koli Cutler, Laura Martin, Katrina Stevens, Tina Thornton, Lisa Kaseman, Stephen Jared, Eric Allen, Tom Romero, Michelle Welk.  Music by: Alan Williams. Jay Ward is a 21st century private eye who uses a time machine to solve a case of a three year old girl kidnapped before he was born. 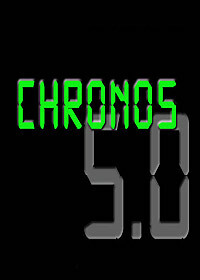 An interesting twist on a popular theme, Chronos 5.0 is the story of a private detective who uses the advantages of time- travel to help solve cases. Koli Cutler is charming and charismatic as the PI who finds himself simultaneously solving a case and on trial for a murder he didn't commit. Time-travel paradoxes and some imaginative writing make this an entertaining film that would have had real potential with a bigger budget and better FX. Review by tereen from the Internet Movie Database.